I’m so so proud of myself for this sweater! I present to you the first sweater I designed! The Essential Sweater! You know that the little black dress is an essential piece for any girl’s wardrobe. 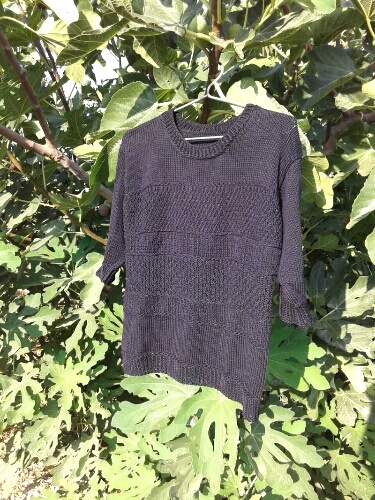 I believe that a black, cotton, short sleeve sweater is also a must! It is a sweater that can be worn all year around and in every occasion. From a chilly summer night combined with shorts or at a business meeting with a pair of linen pants or jeans. I always struggle on what to take with me on business trips. The weather can be very unpredictable and some meals are more formal. This sweater will always be on my luggage, no matter the destination or the kind of trip 😉 For me, it stands up its name. It is essential!! The body has the right amount of texture and by knitting different stitches in each part, helped me “hide” or even change my body’s imperfections. For example, knitting in seed stitch the bust created the illusion that I’m more gifted in that area. Also the stockinette stitch at the sleeves makes my arms look more toned. The yarn is 100% mercerized cotton by E.L. Mouzakis Butterfly Super 10 which is a DK yarn, in black color and I used 4,5mm/US7 needles. As known, cotton yarn makes the stitch definition pop! This is the first time I design a sweater. By the time I tried it on, I actually had tears of joy! I’m very strict with myself and creating something so beautiful out of my head was… weirdly amazing! I was planning to write it down and share it with you but I wanted so badly to show it to you! Maybe when I have more free time…. But when I find time I prefer to knit…. It’s pointless! If anyone is inspired by my sweater and wants to knit it, I’ll be more than happy to help, so feel free to email me. It is a very easy knit, if you have some experience with different stitches and you can always rearrange them according to your body. 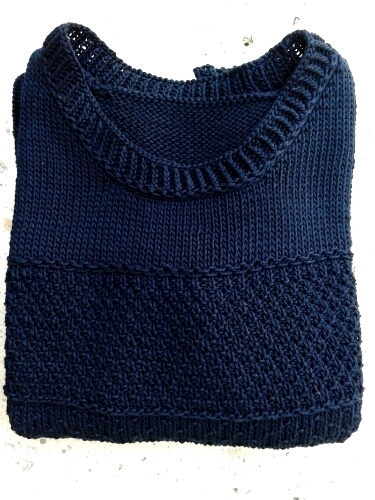 As for the construction, it is knitted bottom-up in the round with no shaping and there is also no shoulder shaping which for me is the best since I have wide shoulders (thank you swimming!). For the shoulder seam, I did a three-needle bind off because I think it holds better when it comes to cotton yarn. 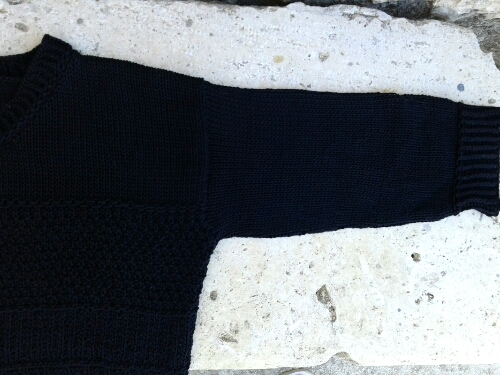 The sleeves were picked up and knitted in round with some degreases. I’m planning on knitting a more winter version of it soon. If anyone is interested, we can have our own unofficial KAL! I think I can manage to break it down to pieces and guide you along the way. This could be so exciting!!! Let me know if you are in! It took me 3,5 skeins which is about 800m. This yarn is heavy. I believe that a more wooly yarn would make a much lighter sweater. Absolutely beautiful!! Congratulations on officially being a sweater designer!!! Wow. Designing a sweater is such an achievement. I don’t even want to try. Sticking with hats and things that have just one size. I’m challenged by the fact that I can’t find clothes that fit me as I want and also that I don’t like going shopping. Living in a place that is limited in that area, has also helped. One size things are great and always a safe way to go. 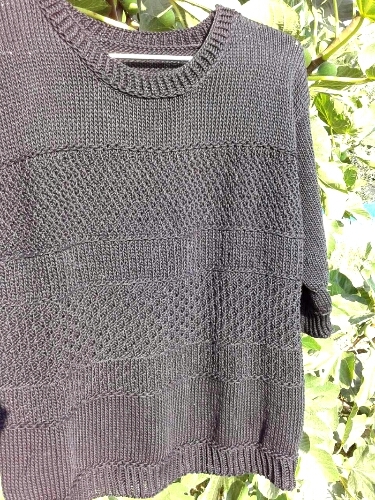 What a great looking sweater, and I love that you designed something classic AND knit it in a wardrobe-friendly colour- it will go with everything! Thankyou so much dear Karen! It is actually a black but in direct sunlight looks a bit blue. No way I could show the texture otherwise though! Congratulations on designing your first sweater! And what a beauty for your first, seems like it’s going to be perfectly suited for your needs! It has already rescued me a couple of times! Congratulations! It looks lovely – bravo! Oh, I am late to the party, but big big hooray to your very own sweater design!! It is a beauty! !